and many miles of pristine coastlines. Kauai is a laidback island complete with idyllic beaches, blue waters, and quaint towns. A lush oasis, Kauai offers travelers gorgeous vistas and unparalleled landscapes. Prepare to be amazed by the stunning cliffs that line the Na Pali coastline, or opt for shoreline snorkeling at Ke‘e Beach or Tunnels. Kauai’s south shore boasts lava arches and green sea turtle cleaning stations, excellent for snorkelers and divers alike. habits while on vacation on Kauai. Going on vacation to Maui? Learn how to choose the right sunscreen that is not only good for you but for the ocean too. There are many reef-safe marketed products so learn which ones are the best. 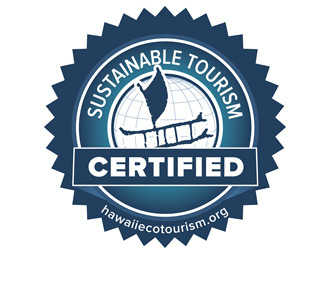 Hawaii Ecotourism Association promotes responsible travel and sustainable tourism in Hawaii through its Certified Sustainable Tour Operator program. Here are some of Be Reef Safe partners on Kauai. Would you like your company or activity featured? Sign up as a Be Reef Safe partner.